Gwenda Bond made a brave step when she entered the DC Universe and took on the tough job of bringing a teenage Lois Lane to life on paper for millions of fans. She did them proud and is now releasing her third book in the Lois Lane series, Triple Threat. With the release a matter of days away, we got to talk with Bond about the upcoming novel, fans reactions to her addition to the universe, and what else she has coming up. Check out what she has to say. KRISTIN: We meet again! How have you been since the release of Lois Lane: Double Down? GWENDA: Good good and busy busy! KRISTIN: You are now days away from the release of your third book in the Lois Lane series, Triple Threat. How long did it take you to write this book? GWENDA: I had a vague idea of what book three might look like when I finished book two, and over the months leading up to the release of Double Down I did some fleshing out of that thinking without putting anything on paper. Once book three was a definite go (which happened soon after Double Down’s release), I put together a pretty quick outline. So that would have been late May/June? Once the outline was approved, I got to work on the first draft and turned it in a around mid-September. Then, of course, there were a couple of rounds of edits! But most of it got written last summer. KRISTIN: The Superman Universe doesn’t really talk too much about Lois Lane in her younger years. It’s more a concentrated on her as an adult. How do you come up with the scenarios teenage Lane gets herself into in this series? GWENDA: That’s been a really freeing thing—the lack of canon to deal with related to Lois’s teen years. Of course, I’m also giving Clark some alternate action, but I try to make sure everything can square more or less with the idea most of us share about who these two become later on and what their relationship looks like as adults. Honestly, Lois feels so real to me at this point, I feel like plotting is as simple as asking: “Okay, what would Lois Lane do?” The scenarios are inspired by real-world issues as well as my favorite wacky comic book super science stuff. 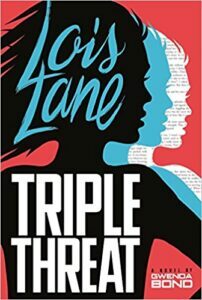 KRISTIN: What can fans of this series expect from Lois Lane: Triple Threat when it comes out May 1st? GWENDA: Well, I’ve been pretty up front about the fact that a certain someone is coming to Metropolis. I hope that readers will be as delighted with the first in-person meetings of SmallvilleGuy and Lois as I was to write them, and will enjoy the other pay-offs and surprises in the book. I definitely had a goal as I was writing: I wanted this book to make people happy. KRISTIN: As the person coming up with these stories, do you feel Lois is learning from mistakes she has made in the beginning, or do you think she often just throws herself into situations and thinks about the repercussions later? 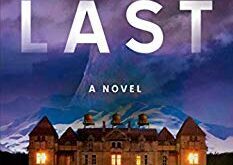 GWENDA: I feel like Lois is the same as many of us in that she learns from her mistakes, vows not to repeat them…and then does so anyway, because her mistakes come from her nature. That said, I do feel like Lois is a different person now than she was at the beginning of book one. She’s invested in her own life in a way I don’t think she was before. In many ways she knows her family better, and she also has these friends and a relationship that has grown from a long-distance friendship into something more. She has more to lose now. But that’s not the kind of thing that’s ever going to make her cautious. If anything, Lois is the kind of person who will fight harder for other people because she has more to lose herself. KRISTIN: Your Lois Lane books are fun to read and incredibly entertaining. I’ve found myself laughing out loud and grinning at my book as people question my sanity. Do you have just as much fun writing it? GWENDA: Yay! That is precisely the thing I love to hear. I do have a blast writing these characters and yes, sometimes I even crack myself up. Yes, I’m that much of a dork. KRISTIN: How would you compare these Lois Lane books to maybe a series from your childhood or other similar series that were somewhat iconic? My example would be the Nancy Drew series with the mystery and chaos all wrapped into one. GWENDA: Many mystery series for teens and kids share a family resemblance with these books; you’re absolutely right. I think probably the strongest influences outside the comics have been two TV series, though—Veronica Mars and Buffy, two of my all-time favorite shows. I’d be happy for this Loisverse to be seen as similar to those, but honestly, I take it as a compliment when anyone compares it to anything they enjoy. I’m a voracious reader and mix-and-matcher of genres and media. KRISTIN: What made you want to write these books when this fandom can be very tough on those who attempt to bring to life stories they have grown up with? GWENDA: Certainly it was a challenge I knew I faced going in. I’ve been a comics reader for a long time and I know how much these characters mean to people, because they mean so much to me too. I’d be lying if I said I wasn’t equal measures terrified and excited by the fact I knew going in there was this huge Superman and Lois Lane fandom out there. And I can’t even express how relieved I was when that fandom embraced me and the books. Tim Hanley (who has since published a great nonfiction book about Lois’s history) was one of the first people I heard from, along with two other long-time members of the Lois Lane fan community, and at that point I breathed easier. I was glad to have some outside confirmation I hadn’t screwed everything up. But mostly I just tried to write the Lois Lane books that I would have felt were a gift as a reader. KRISTIN: I know you’ve always said in the past that you don’t know yet, but with the success of this series so far are you plotting out book four yet? 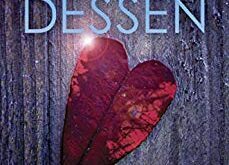 GWENDA: Ha! I will admit that I always have an idea of what happens next when I finish a book, but I want to be honest and say at this point we haven’t discussed a book four and there’s not one planned. But I will never say never, because I enjoy writing these characters so much. In publishing, it’s all about demand. So, yes, once again: Everyone keep telling people about the series. You never know! I’m so grateful to the fans of this series who get all the credit for there being more than one book. That’s all down to you guys. KRISTIN: Entertainment Weekly has said Triple Threat is one of the most anticipated YA Fiction novels of 2017. How does that feel to know your work has everyone so hyped? KRISTIN: Are you working on any other projects (aside from the fourth book – fingers crossed!)? 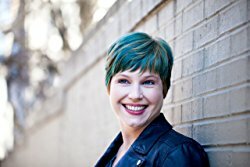 GWENDA: My husband and I are co-writing a series for younger readers together, The Supernormal Sleuthing Service, and the first book, The Lost Legacy, is out the same week as Lois 3. It’s about three kids whose parents work in a hotel for monsters in New York City and the adventures and mysteries they become involved in. We’re just finishing up the second book in it now. And I have a couple of secret YA things I’m working on too. Oh! And I have another YA out from Switch Press this summer, Strange Alchemy, which is an unusual project in that I got to revise and reimagine the first book I published after getting the rights back; it’s a modern take on the Lost Colony of Roanoke Island. KRISTIN: To wrap up, what would you say to all those fans that have supported you and are anxiously awaiting the release of Lois Lane: Triple Threat after devouring Fallout and Double Down? GWENDA: THANK YOU THANK YOU THANK YOU. It’s been such a pleasure getting to know so many of you, and I can’t tell you how much I adore you all. Your support has made the series and I will be forever grateful. I can promise everyone that Lois Lane: Triple Threat is worth the read. 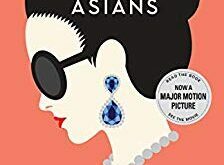 Check out my review of the upcoming book here! I will definitely be cheering for a book four in the series and checking out all of Bond’s upcoming work as well. Pick up your copy of Lois Lane: Triple Threat copy on Amazon or Barnes and Noble, or pick up a copy at your local bookstore.